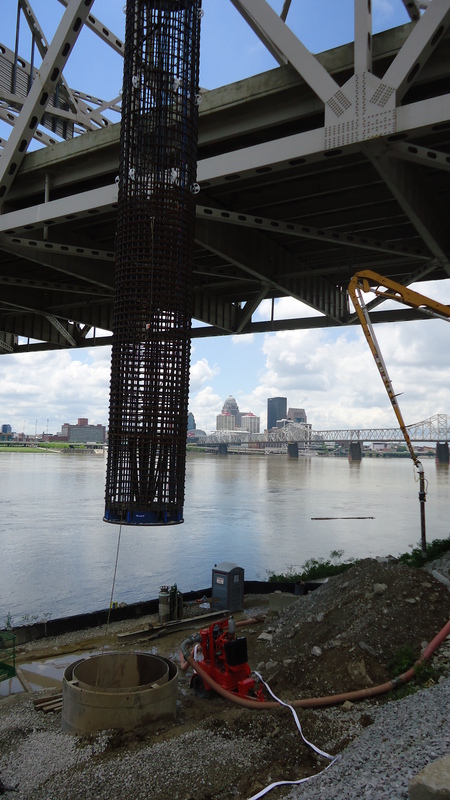 GAINESVILLE, FL – May 28, 2013, LOADTEST announces a new World Record static load test of a single foundation caisson on the Ohio River Bridges Downtown Crossing. The test using Loadtest’s patented Osterberg Cell® (O-Cell) method produced a loading of 72,666 kips (323 MN) on the 90‑inch (2.29m) diameter pile. It exceeded the previous O‑Cell World Record, established in 2010 in St Louis, Missouri on the I-70 Mississippi River Bridge project by 532 kips (2.4 MN). Although the old record wasn't exactly shattered, proving once more that tests of this magnitude are achievable and that higher than average unit skin and end bearing resistances are possible in hard rock formations is a satisfying advancement of the drilled shaft industry. The Downtown Crossing is being built roughly parallel to the existing John F. Kennedy Memorial Bridge, to accommodate six lanes of northbound I-65 traffic with separate pedestrian and bicycle lanes. The joint Indiana and Kentucky project is being managed by Kentucky Transportation Cabinet (KYTC) and delivered through a design-build contract with Walsh Construction Company. Geotechnical conditions throughout the bridge locations indicated the presence of a significant layer of high strength limestone into which the bridge foundations could be founded. Accommodating the bridges' lateral loading conditions required a minimum rock socket length. With a standard geotechnical design approach, the axial design loads required socket lengths deeper than those required for the lateral loading conditions. Recognizing conventional geotechnical design's inherent conservatism, the design-build team sought a means to remove it for the large diameter high capacity drilled shafts. The O-Cell's bi-directional method was selected as the best solution for removal of this conservatism. Use of the O-Cell produced added advantages by confirming a more competitive design with shorter drilled shaft rock sockets, thus producing more economical foundations. This in turn managed project schedule and time risks for the design-build team. Jack Hayes is published in Deep Foundations magazine. Read the full article.